I had a dear friend over for dinner last night. She is one of the few friends who can get away with actually sending me the recipes she wants me to cook for her. The reason she gets away with it is that she gets as excited about new recipes as I do and we have very similar taste. Firstly she insisted I serve her some Pimm's cup after I had been waxing lyrical about it all week and she sent me two recipe cards from the last edition of Crush online. The fabulous things is the two recipes she sent me had been the two recipes which I had also taken special note of from that edition. 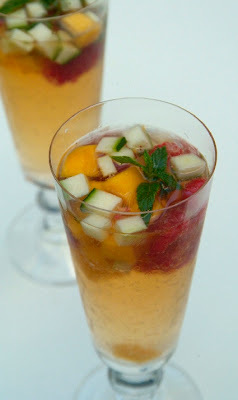 But let me start by saying that I changed my Pimm's cup fruit and it was delicious! I used cucumber and mint as the standard but I added raspberries and mango as the variation. I diced the fruit this time as it is nice to get a few bits of fruit with each mouth full! Oh boy, I love Pimm's. Sorry, no other pictures. The meal below had my hands full! As a snack for us to munch while we caught up, I served a mushroom scented cream cheese and green lentil dip with julienne carrots and cucumber. This dip was a total fluke, but in Annika's words "this is silly good". I am going to make it again today and will take proper recipe notes this time so I can share it with you. 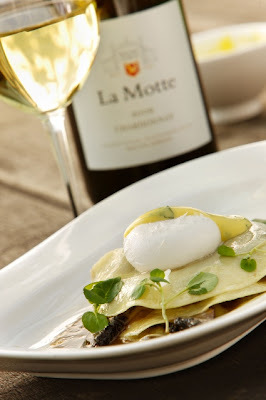 The main course was the Butternut and mushroom open lasagna with poached egg and hollandaise by Chris Erasmus of Pierneef at La Motte. To make this dish took us about two hours (granted there was quite a bit of Pimm's and chatter in between). My kitchen looked like a tornado had hit with so many pots, boards, bowls and surfaces used to make the meal. It took two of us to get the meal plated and hot to the table before the eggs started slipping off the hollandaise. BUT the end result was delicious. There was real synergy between the flavours. The zesty hollaindaise cut through the savory sweet filling; while the egg lent the soothing protein element which would have been missing without meat or cheese in the dish. A very satisfying meal indeed. My personal recommendation however, would be to go to La Motte and get Chris to make it for you himself! We didn't end up making the dessert, Francois Ferreira's Summer Clafoutis, as we were so full. But I have all the ingredients, so may need to whip it up for us tonight. Yum, can't wait!